You are here: Home / Media Center / Fiscal policy in the US: Ghosts of the past? In the past five months, President Trump signed into law the TCJA (Tax Cuts and Job Act, on December 22, 2017) and the 2018 Bi-Partisan Budget Act (on February 9, 2018), which was recently completed with the FY2018 Omnibus Appropriation Bill (on March 23, 2019). 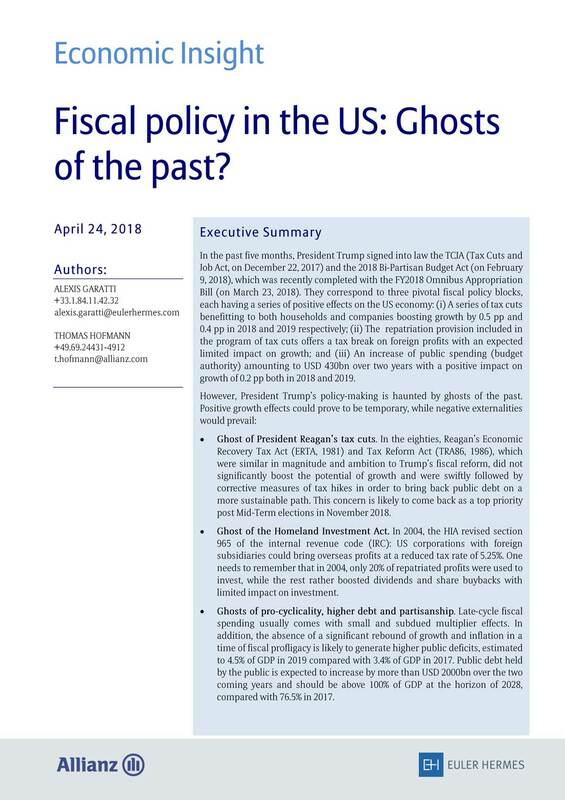 They correspond to three pivotal fiscal policy blocks, each having a series of positive effects on the US economy: a series of tax cuts benefitting to both households and companies boosting growth by 0.5 pp and 0.4 pp in 2018 and 2019 respectively; the repatriation provision included in the program of tax cuts offers a tax break on foreign profits with an expected limited impact on growth; and an increase of public spending (budget authority) amounting to USD 430bn over two years with a positive impact on growth of 0.2 pp both in 2018 and 2019.